Over the past month or so the Distilled Design and Events team have been working hard to rebrand Distilled's events. But why are we rebranding our events? Earlier this year we held two link building conferences, one in London and one in New Orleans, aptly, though not very creatively, named ‘Distilled’s Link Building Conference’. The Link Building character was our robot spider, we didn't have a logo for the conferences. Our delegates took to calling them the ‘linklove conferences’, due to the #linklove twitter handle associated with the event. After the dust had settled on both events, it became apparent how attached the team and attendees had become to the name. After a night of brainstorming in Boston with Distilled's two directors and Rand from SEOmoz, we decided to rebrand Distilled events to incorporate the new name. Distilled’s Link Building Conference became (the much more memorable) ‘LinkLove’ and our flagship ‘ProSEO’ conference was renamed ‘SearchLove’. And so we embarked on our rebranding journey. Create a logo, for our new SearchLove and LinkLove events. The target audience: male - 86% female 14% (statistics from our previous events), age range 25 – 40, tech savy, with a desire to learn and keep up to date with all things new in the world of search marketing and the internet. With Distilled as the umbrella brand for the new conferences, we wanted the logo to reflect our culture: innovative, advanced and fun. There is a large community surrounding the search industry; events are not just conferences, but are equally about networking and the search community as a whole. Our aim is to create brand empathy, something that the attendees can connect with. Distilled is a small company with a start-up vibe, keeping us on the pulse of what is new in search, our team are constantly learning and challenging existing ways of thinking. Importantly the logo must be recognisable and set us apart from our competitors. We began the process by going to exhibitions and looking in design books and online for inspiration. Next a massive mind map. We decided on a sans serif typeface relatively early on. A serif typeface would have been overly fussy, too classic, conservative and not punchy or modern enough for the impact we needed. So the search began for a distinctive sans serif typeface. We also needed to be extremely careful with the word 'love' in our logo to keep it as far away from a dating brand as possible! We started off in monochrome, forcing us to focus on a distinctive mark, without getting distracted by colour. This logo used type face Futura, with a play on the type in both the words 'link' and 'love'. We also took the individual drops from the existing Distilled logo and created a slightly abstract heart shape. This logo was discounted on the basis that it was too near to the Distilled brand and also not masculine enough to not be confused as a dating brand. The text here is hand drawn and flows out of the computer mouse. Although this logo is visually pleasing, we thought it was too delicate and feminine. We also had concerns about how it would translate at a smaller scale, see the smaller versions above. Manipulated block caps Bebas used here gives the impact we want, although there are concerns about the word 'love' being reminiscent of the 'lovefilm' brand; there were also concerns about Century Gothic, used for the word 'conference', being overused generally in other logos. The magnifying glass and links appearing within the speech bubbles seemed to encompass everything SEO and relate to speaking, networking, learning and conferences.The events team chose this logo to run with. The design team here fell in love with this logo (maybe its just a designer thing). The type face used is Klavika. It is angular, very modern looking, techy almost, serious without being boring, and still has a flare that sets it apart from a standard san serif typeface. The pixel idea is reminiscent of old computer games and early computer graphics, tapping into a computer experts nostalgia. This logo works in any size, the smaller it gets, the magnifying glass and links within the pixelated speech bubbles becoming ever clearer. What do the general public (our target audience) think? We went to Starbucks to hound some poor unsuspecting people into helping us with our market research. The design team were very happy as our preferred design had been selected, however we had noticed a trend of it alienating older audiences, who did not seem to grasp the retro feel and the play on pixels. An example comment made was: 'it looks all fuzzy and broken'. Taking on both the Events team (our internal client) and the general public's thoughts we set to work adding in colour and developing the logo further. Being the headstrong team that we are we set about getting our own way (in a round about way). Klavika certainly seemed to be a much stronger type face than Bebas and also suits our target audience more closely, we also preferred the straight lines and dramatic angles that the pixelated speech bubble has. Working with all this and the Distilled umbrella brand in mind, we began to experiment with other geometric shapes, taking a mathematical approach. The final product is clean and clear to all audiences and is the right choice for our new brands Searchlove and Linklove. We spent many hours playing around with hexagons and octagons but after a while it became clear that a septagon was our friend. Keeping the angular shapes of the pixelated design, we created something more legible and accessible. We wanted to have some connection to the Distilled brand so we have incorporated the two masculine colours blue and green, from the drips in our emblem. The blue was chosen for 'link' as blue is ordinarily used for links on websites. The word 'conference' is also included to clarify what the logo is branding. 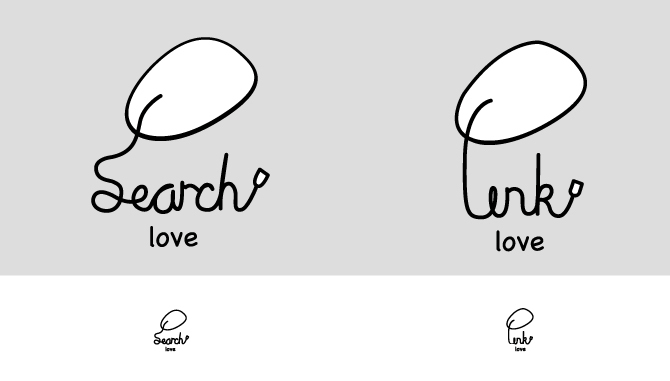 So without further ado, here is the final logo, for our 'Searchlove' and 'Linklove' conferences. We are holding two SearchLove conferences later this year in both London and the Big Apple. Hope to see you there!